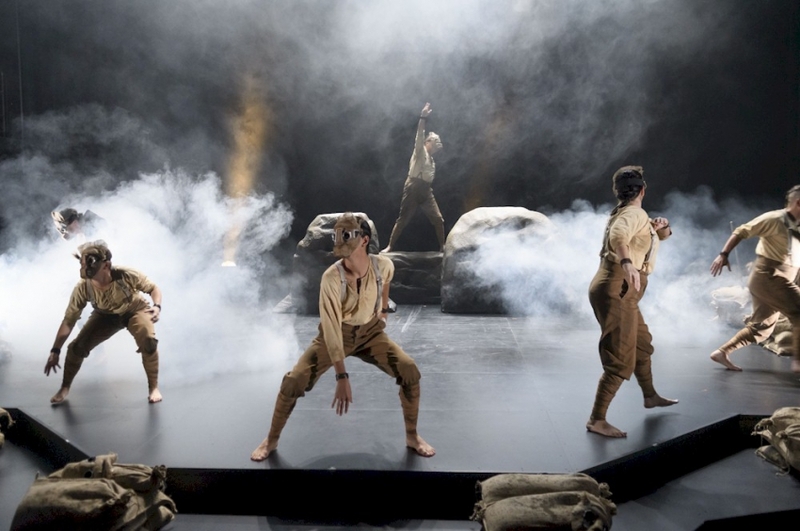 Indigenous take on WW I as Arts Club remounts Hardline' Productions' innovative "Redpatch"
As we’ve all learned in civics class (or, in my case, citizenship test-prep), the World War I Battle of Vimy Ridge still stands as the pinnacle of our country’s military glory. So doughty were the Canadian “Redpatch” brigades (so-named for their distinguishing shoulder insignia) that their British commanders accorded them the “honour” of spearheading the 1917 Allied drive to retake German strongholds on the Arras Front of France. Less well known, the spearhead of the spearhead comprised some 4,000 First Nations soldiers who adapted their hunting and wilderness survival skills to serve as scouts, trench-raiders and snipers. And spearhead of the spearhead of the spearhead, as we learn in Hardline Productions’ one-act melodrama Redpatch, was a spade-shaped blade in the hands of Private Half-Blood, a Nootka enlistee. Half-Blood carefully hand-honed the weapon out of an ordinary entrenching shovel and augmented it with a cockspur dagger. Its haft was scored with over a hundred notches for the victims he felled in hand-to-hand combat in the No-Man’s Land of the Western Front. But this storied artefact is only to be seen on the Arts Club’s Goldcorps stage, instead of the Canadian War Museum. The reason is that it never actually existed, in a literal sense. The mighty Bosch-bludgeon, like Half-Blood himself, is a fictive creation of Métis playwright/actor Raes Calvert. Or rather let’s call them composites, to properly credit the painstaking background research of Calvert and his co-author, Sean Harris Oliver, in creating Redpatch. The main ingredients in the composites are Calvert’s own ancestors and those of other cast and crew members, many of them survivors of various wars and Residential Schools. In a burst of extreme Stanislavskianism, the team also made a strenuous Vancouver Island road trip to imbibe the sights, sounds and aboriginal lore of Half-Blood’s ancestral home. Calvert stars as Half-Blood. We follow him from the pebbly shores of his native Yuquot Island to the killing fields of Pas-de-Calais. Along the way, he’s nurtured by his anti-War, talisman-dispensing Grandmother, as well as a guardian Spirit Raven and a blustery (but gruffly caring) Platoon Sergeant. Odessa Shuquaya plays all three roles, in an impressive display of versatility. We also meet Half-Blood’s platoon mates – a jocund bigot of a prairie farmboy (Chelsea Rose), a sympathetic Torontonian med student (Taran Kootenhayoo) and a weak-willed Québécois hothead (Jenny Daigle). Their interactions present a microcosm of the fault lines and fragile bonds of a multifarious settler state under stress, especially from a First Nations perspective. Then there’s the enigmatic figure of Half-Blood’s old Yuquot bestie, Jonathan (Joel Montgrand). The two of them once shared ill-starred canoe-rustling, whale-hunting exploits back in Residential School days, recounted in flashbacks. Now, improbably enough, they’re reunited on the battlefield, but mainly in No-Man’s Land rather than the context of platoon life. The highly stylized production cleverly evokes the battlefield in a stylized way. With just a few moveable hummocks and some stage smoke, set designer Pam Johnson creates a hellscape of trenches, craters and poisonous miasmas. A lot of flash and bang, supplied respectively by lighting designer Brad Trenaman and sound designer Mary Jane Paquette. Christopher David Gauthier’s costumes suggest clunky, sodden military gear with just some flexible khaki swaddling – not even footwear, let alone weapons, which are all merely pantomimed (except for Half-Blood’s indomitable spade/spear). 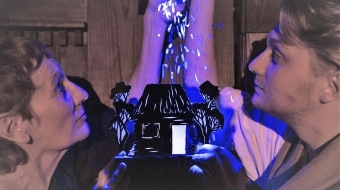 Such minimalism only heightens the play’s unsparing depiction of the horrors of war – everything from trench foot to “friendly fire” casualties. But the horrors that most beset Half-Blood, as he notches up ever more grooves on his spade handle, are remorse, survivor’s guilt and what was then called “shell shock” – post-traumatic stress, in modern parlance. Pushed past the brink, he needs to get out of Vimy Ridge even at the heroic “finest hour” of “his” country. 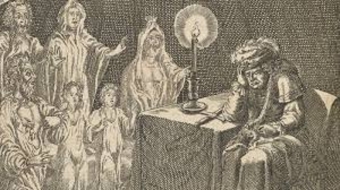 But first he must wrest back his Grandma’s talisman from his alter-ego, Jonathan. No spoilers here of the somewhat contrived denouement, but suffice it to say that Half-Blood makes it home to Yuquot at last. Redpatch is an eminently worthy project conducted with some artistic flair. In the current climate of (at least aspirational) Reconciliation, it comes as less of a shocker to see some colonialist shade cast upon our military triumphalism. Melodrama is, after all, theatrical comfort food.